Houzz 25 of our visitors have told a friend about this plan. Stone, brick, and shake siding combine to create a stunning appearance for this rustic home. Inside you will find an open floor plan concept for the great room and kitchen. A vaulted ceiling with exposed beams, high bar, and walk-in pantry are just a few of the amenities in this area. The spacious master suite is privately located in the rear right side of the home. On the other side of the house, you’ll find bedrooms 2, 3, and 4, each with a walk-in closet, a Jack & Jill bath between bedrooms 3 and 4, and a hall bath that also has private access for bedroom 2. More space can be found upstairs with the large bonus room, full bath, and walk-in closet. Question: Where would the utilities be located for this plan? Answer: Our plans include the electrical plan. The items that are site specific such as sewer and water and HVAC will be created on site by the appropriate professional using the existing pages of the plan. Question: Which rooms have the 9' ceilings? What are the interior door heights? Answer: Approximate max height is 18’-20’ at top of vault, this depends on building material. There is a 10’ plate line. Question: What is the exact square footage of heated space LESS the bonus room? 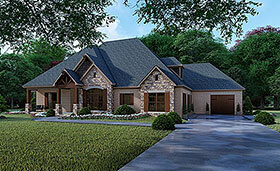 Answer: The heated/cooled space in this plan minus the bonus room is 2661 sq feet. Answer: You would just need to contact us after finding out modifications are needed and we would be happy to make the changes, the fee would be based on how extensive the changes are. Question: How big is the closet’s in the master? Question: Thank you so much. Do you have any diagrams showing the Basement layout? Is it similar to the upstairs or are here any areas that are unfinished? Answer: Sorry, no diagrams. The basement will just about mirror the footprint of the main level minus the garages and porch areas, it may change a little after adding the basement stairs but not much at all. It will be one large open space unfinished. Question: What is the size of the closets in the master bath? This is plan 82356. Thanks. Answer: Yes, this dimension includes the rear porch. Question: Do you have this plan with three bedrooms? Answer: Yes, please see plan 82179.